A Roku is a device (made by the company Roku) that streams media (shows, movies, and even music) from the internet to your TV. The devices require minimal setup and connect to the internet the same way your PC does. Roku media streaming devices incorporate an operating system (OS) that allows users to access and manage internet streaming content. Roku Box: This option is a standalone box that connects to the internet via your broadband router using either Ethernet or Wi-Fi connection. A Roku Box can connect directly to your TV, or through a home theater receiver, via HDMI (like a DVD or Blu-ray player). Roku Streaming Stick: This option is a compact device that is slightly larger than a USB flash drive, but instead of plugging into a USB port, you plug it into an available HDMI input your TV or home theater receiver. The streaming stick has built-in Wi-Fi for connection to a broadband router. Roku TV: A Roku TV is an all-in-one solution that does not require the connection of an external box or stick to access internet streaming content as the Roku operating system is already built into the TV. The TV connects your broadband router either via Wi-Fi or Ethernet connection. TV brands that offer Roku TVs in their product lines include Hisense, Hitachi, Insignia, Sharp, and TCL. Roku TVs come in several screens sizes, and 720p, 1080p, and 4K Ultra HD versions are available. There are a lot of products available that can add internet streaming to your TV viewing and music listening experience, and Roku devices are some of the most popular. Others include Google Chromecast and Amazon Fire TV. However, although there are many free internet streaming channels, there are also many that require an additional subscription or pay-per-view fees in order to access content. To be clear, you buy the Roku device and you'll maybe still have to pay for things to watch. In addition to internet streaming channels, Roku also provides additional apps that allow users to access video, music, and still image content stored on PCs or media servers that may also be connected to your home network. For a complete channel and app listing, check out the Roku What's On Page. Beyond streaming, on most Roku TVs as well as select Roku boxes, the ability to play back video, music, and still image files stored on USB flash drives may be provided. This capability is not available on Roku Streaming Sticks. You can take your Roku Box or Streaming Stick with you when you travel. When staying in a hotel, someone else's house, or even a dorm room, you'll just need to plug the Roku device into the HDMI port of the TV. You'll also need access to Wi-Fi. Just follow the additional instructions after logging in to your account, and you'll be good to go. For Roku boxes, don't forget to pack an HDMI or ethernet cable just in case you need one! Roku also provides a mobile app for iOS and Android devices that allow even more flexibility. The mobile app provides Voice Search, as well as duplicating several menu categories that are a part of the main Roku TV onscreen menu system, allowing you to control Roku devices directly from your phone. For Roku TVs, the mobile app also controls both internet streaming and TV functions, such as input selection, OTA channel scanning, and both picture and audio settings. You can also use a smartphone or tablet to send videos and photos from the phone to a Roku box, streaming stick, and see them on your TV, or directly from the phone to a Roku TV. Another added bonus is that you can use your smartphone's earphones for private listening of the content you are accessing on your Roku device. Connect the Roku Box or Streaming Stick to your TV, or turn on your Roku TV. Establish wired or wireless network access. If using Wi-Fi, the device will search all available networks - choose yours and enter your Wi-Fi password. Enter a code number to activate the Roku product. Use your PC, Laptop, Tablet, or Smartphone to go to Roku.com/Link. Enter the code as instructed. Create a user, password, and address information, and also a credit card or PayPal Account number. There is no charge for using Roku devices, but payment information is requested to make it quick and easy to make content rental payments, purchases, or pay additional subscription fees if needed. If you have a Roku TV, additional items, such as verification of an antenna or cable TV connection and channel scanning will be included in the setup procedure. At the end of the setup process, the Roku Home Menu will appear and enable you to access the device operation and channels/apps selection. Once you get a Roku device up and running, here are some great convenience features that you can take advantage of. Voice Search: Roku's onscreen menu is easy to navigate using the buttons on the remote control, but if you have a Roku device that includes a voice-enabled remote control or you use the Roku Mobile App, you can use voice search to find content by actor, directors, movie or program title, or launch streaming channels in natural language. TV Everywhere Single Sign-On: For those that use a Roku Device in combination with cable or satellite service, this feature reduces the constant need to log into TV Everywhere channels constantly. TV Everywhere Single-On (TVE) allows users to store up to 30 channel sign-ons. The Roku Channel: Although Roku serves as a gateway to thousands of internet streaming services and channels it also offers free movies and TV shows on its own Roku Channel without having to log in or pay any subscription fees. However, there are limited commercials. 4K Spotlight Channel: For users of either a Roku 4K-enabled streaming stick, box, or TV, a special onscreen menu option is provided that makes it easy to find 4K content via categories, such as genre. The 4K spotlight channel only appears when a 4K-enabled streaming stick or box detects that is it connected to a compatible 4K Ultra HD TV. The 4K spotlight channel is built-into 4K-enabled Roku TVs. For those that opt for a Roku TV and, in addition to streaming, you can use it to also access TV programs using a connected antenna. Also, Roku provides some added conveniences specifically for Roku TVs. Smart Guide: This feature combines both over-the-air TV channel listings with streaming channel app listings for a more seamless navigation experience. You can also list your favorites, and for streaming content, allow you to play from the beginning or resume playback from a specific point. You can also display broadcast TV listings up to 14-days in advance. Roku Search For Over-The-Air Content: Not only does search work with streaming content (up to 500 channel apps), but you can also search through over-the-air content in combination. If you find a program listed on both, you can just simply choose with one to watch. Voice Control For Roku TVs: In addition to Roku functions, such as searching and launching apps, Roku TV voice control can also be used to switch TV inputs and tune to a local broadcast channel. Also for those that do not have a voice control remote, you can use a compatible mobile phone to perform these voice control tasks. Fast TV Start: Voice control allows the user to turn on the TV, go to a specific over-the-air TV channel or launch a streaming channel app. In other words, with the TV off, you can give a command such as "launch Netflix" or "Tune to CBS" and the TV will turn on and go directly to that channel or app. Private Listening For Roku TVs: On select Roku TVs, users can listen to antenna-received or streaming programming via earphones connected to either a headphone jack-equipped Roku remote control or earphones plugged into a compatible smartphone. Optional Roku TV Wireless Speakers: To get better sound for your Roku TV, you can connect it to a sound bar or home theater audio system, but Roku also offers up their own wireless speaker system specifically made to pair with Roku TVs. Which Roku Option Is Best For You? Roku provides several options for adding comprehensive internet streaming to your TV viewing and music listening experience, but which option is right for you? If you have a TV with an HDMI connection but it does not have smart features — consider adding a Roku streaming stick or Roku box. If you have an older TV that does not have an HDMI input — Roku makes a limited number of models, such as the Roku Express+ that will connect to a TV using analog video/audio connections. If you have a smart TV, but it doesn't offer the streaming channels you want — you can add a standard Roku Streaming Stick or Roku Express box, as a way to expand your selection. 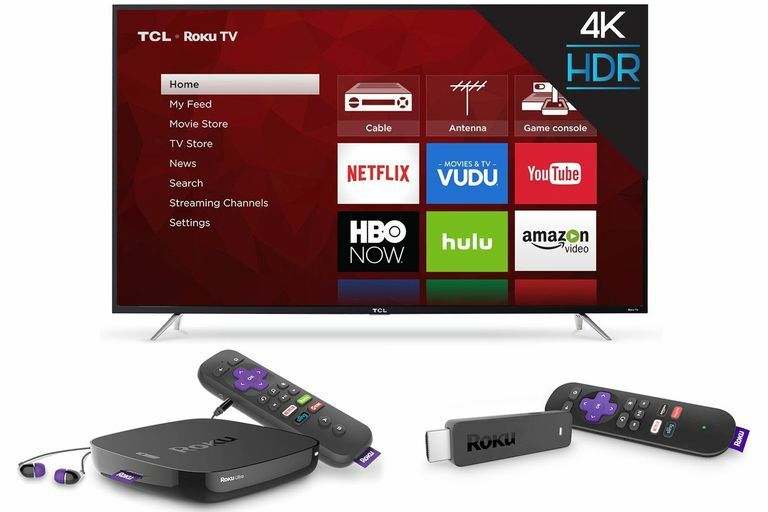 If you have a 4K Ultra HD TV and it is not a smart TV, or it is a smart TV that does not offer enough streaming channels, consider the Streaming Stick+ or Roku Ultra that support 4K streaming available from selected apps. If you are in the market for a new 1080p or 4K Ultra HD Smart TV — a Roku TV might be an option to consider. Roku products provide a practical and affordable way to add internet streaming or expand internet streaming options, to the TV and home theater viewing experience.